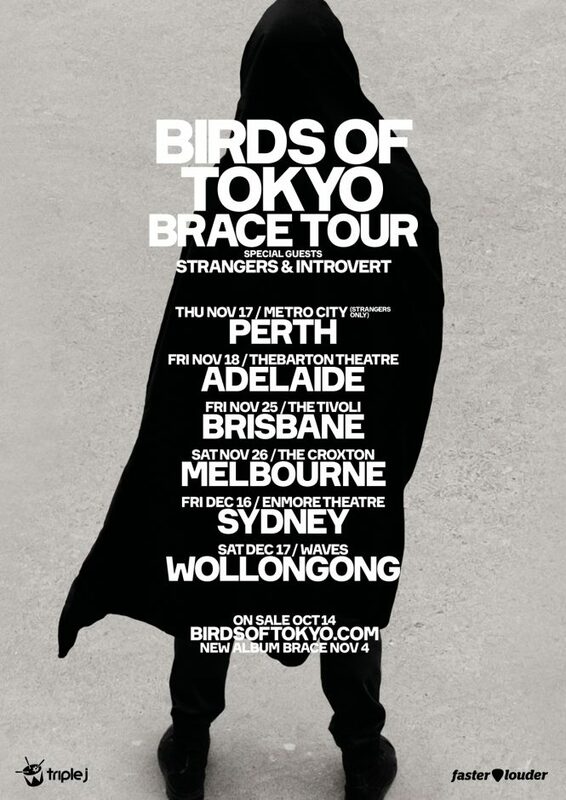 With the most played track on Triple J and a new album landing November 4 Birds of Tokyo have just announced their first national tour in over a year. Tickets will go on sale to the general public on October 14 but members of the band’s mailing list will receive early access from Wednesday 12th. Dates are listed below. The group unveiled the dark, dystopic feel of their new material at a special secret gig in inner Sydney a few weeks ago. This forthcoming run of dates will see Birds of Tokyo bringing that same epic rock show to all parts of the country. Fans of the early Birds of Tokyo work have already been hailing the album’s title track “Brace” as a welcome return to their heavier roots. Produced by David Bottrill (Tool, King Crimson, Silverchair, Muse) the heavier sounds and mood of the song has also been attracting some new fans. Those who like the single will love the album which is an unusually cohesive piece of work. From the brutal opening riffage of “Harlequins” it’s clear that the band has a point to prove and all is not well. It should be no surprise that these songs were written during the rise of Trump and the return of Hanson. It’s not an overtly political album but an end-of-days mindset pervades the entire album. The choice of supports reinforces this strong statement of intent with Melbourne via Sydney buzzband Strangers and the brooding heaviness of Newcastle’s Introvert making for a huge night of post-apocalyptic Rock. Perth locals Pat Chow will kick off at Metro City.